We can help you adapt to life in your new country! English Language training geared to your occupation. – Nursing, personal support work, dental hygiene, etc. – you are a permanent resident or protected person. Mastering the language is the key to success. 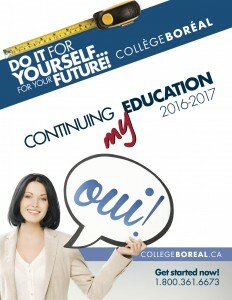 A LINC course at Collège Boréal is what you need to succeed. This course is dedicated to newcomers who wish to learn or master English. This course is based on the Canadian Language Benchmarks (CLB) and runs throughout the year (see the schedule below). One of the most important skills you will need to adapt to life here in Canada is to master the language. This course gives the students the fundamental basics of the English language in a francophone environment. Once the students have learned English, it will be easier for them to know what Canada is all about and to find a job. This course is dedicated to newcomers who have achieved level 6 of the Canadian Language Benchmarks (CLB). This course will allow the student to improve his or her language skills. The participants after a 13-week in class language training will participate in a 5-week placement with a Canadian company or a mentorship for the same period of time. The French Language Instruction for Newcomers to Canada (CLIC) is designed to help learners improve their proficiency in French in order to increase their opportunities for a successful integration into the Canadian job market. There is a strong focus on the Canadian cultural appropriateness in both social and workplace situations. The course focuses on the development of the four basic language skills: Listening, Speaking, Reading, and Writing and is based on the Canadian Language Benchmarks (CLBs). Students may expect a stimulating, diversified and rewarding environment. This course promotes ‘la francophonie’ by using a variety of teaching strategies, including information and communication technologies (ICT), guest speakers, team projects and individual tasks. CLIC-français is a continuous intake part-time program which runs throughout the year. This multidimensional full-time program was created to facilitate the integration in the labour market of Internationally Educated Francophone Professionals in the fields of Social Sciences and Humanities, Economics, Psychology, Social Work, Sociology, Human Resources, Marketing, Education, Arts and Culture, Health and Tourism and Hospitality.By allowing them to transfer their knowledge, skills and work experience in their field of expertise, finishing participants are ideal candidates for bilingual middle management positions that do not require a license or credentials. C. Is this Program the Right Fit for You?